Whether you are looking for a residential or a commercial garage door, the ability to customize exactly what you want can be found at Carroll Garage Doors in Ventura County. You can even use our design center’s virtual tools to see exactly what the door will look like before you purchase it. 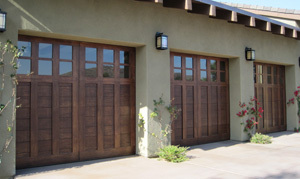 There are many things you can choose from when creating custom garage doors. Homes come in many styles, as do garage doors. You may want to start with the style of your home. For instance, a Victorian home would require a different garage door than a contemporary home would if you want the curb appeal of the home to stay the same or improve. You should be careful to select a style that matches your house well. Of course, you will need to determine the material you want the custom garage door to be made out of. Each of these materials has advantages that you will want to weigh as you make your choice. For instance, steel is very low-maintenance, but wood brings a natural beauty and warmth to the overall appearance of the home. Decorative hardware that runs from traditional to contemporary and everywhere in between. As you can see, there is quite a bit of personalization that can take place when you are selecting custom garage doors for your home or business. Give Carroll Garage Doors a call today to begin the process of customizing your new garage door.